Would love to be there with you!! Looks amazing! Terrific shot. Congratulations on being the People's Choice Winner. Great shot. Congrats on your award. Congratulations on a fantastic capture! Pure beauty! Absolutely stunning!! Great composition and magnificent view!! My previous comment refers. Congratulations on being Featured. Great composition, congrats on your feature! I can almost hear the silence of the moment. Congratulations! Stunning shot - I can just smell the clean clear air and water. Congratulations on this fabulous capture. Fantastic perspective and composition. Congartulations on your Feature! Amazing job. Congrats on being featured. Nice photo. 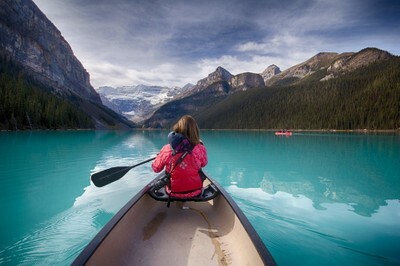 I've never seen Lake Louise portrayed like this. Very original. Beautiful composition, congrats on your feature! It's like seeing in 3D! Splendid! Gorgeous shot,great composition,pov,love the water. Another perfect shot. It is clear and crispy. Gives you the notion that you are seating in the boat as well. Spectacular shot. Love the point of view. Mother nature never disappoints. Love it! I recogninze this mountain! I would have to put this one on the wall! Perfect! Oh wow! This gives a feeling of adventure to me! Such a great shot, feels like I am actually there. But, that would be a bad thing I most certainly would have tipped the canoe over.